Two autumns ago, when I was hugely pregnant with Matthew, despite the horrific heartburn, all I wanted to eat was tomato soup. Not tomato soup from the can, but from scratch. I begged my cousin Rhea, one of the best cooks I know, for her recipe. I’ve tweaked it a bit, swapping out the fresh basil for a spoonful of pesto, but aside from that, I owe this all to her. That fall, I made three double batches of this soup. Pregnancy cravings cannot be denied. Now, I make one double batch each fall. And the only person in my house who loves it the way I do is Matthew. Go figure…it’s probably in his veins. 1) In a heavy saucepan over medium-high heat, melt the butter and sauté the onion and garlic until translucent, roughly 5 minutes. 2) Add the white wine and reduce by half. 3) Add the tomatoes and cream and reduce by half (I reduce the heat to medium at this point). 4) Puree in a food processor or blender until smooth. 5) Top with a teaspoon of pesto. *I am not even going to pretend that this part is healthy. Nope. It is what it is. Enjoy! i've never had tomato soup but this does leave me wanting some. 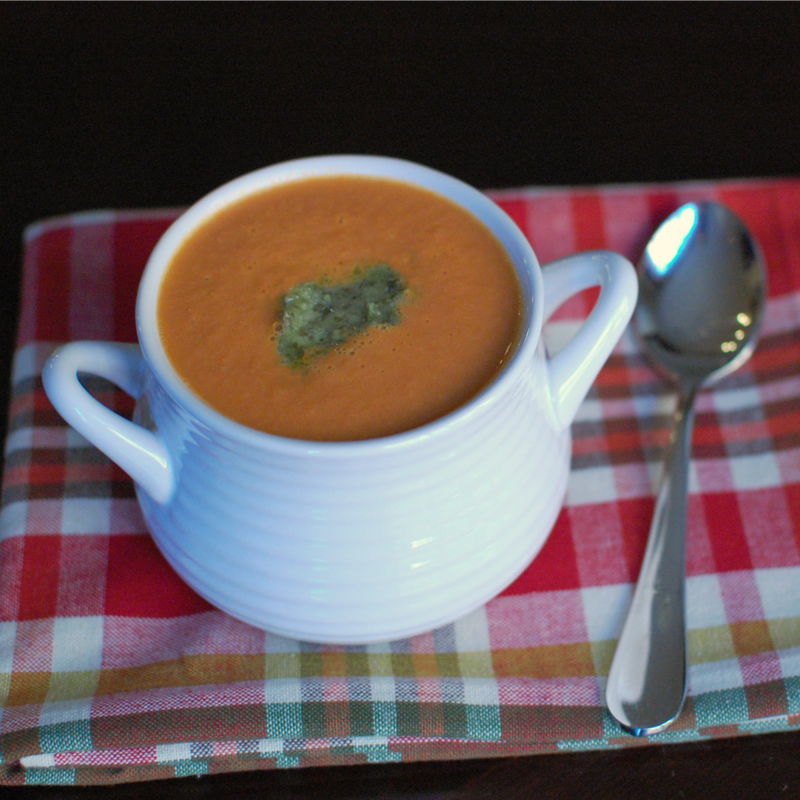 Mmmm…I love tomato soup, but I have never made it. I may try. We just started making tomato soup, instead of just buying it, and it is much better . . . but you left the part out about drinking the rest of the bottle of wine! Love tomato soup. Especially with grilled cheese sandwiches on raining days. I don't know why but I've never liked tomato soup. When my mom would make it, I'd do that gag thing without even tasting it. adding the pesto, hmmm, may be a change in my future. I really hope the next step is to share the remaining Fetzer with a friend. Perhaps one in southern California? OH, yes please. With a really good grilled cheese sandwich. 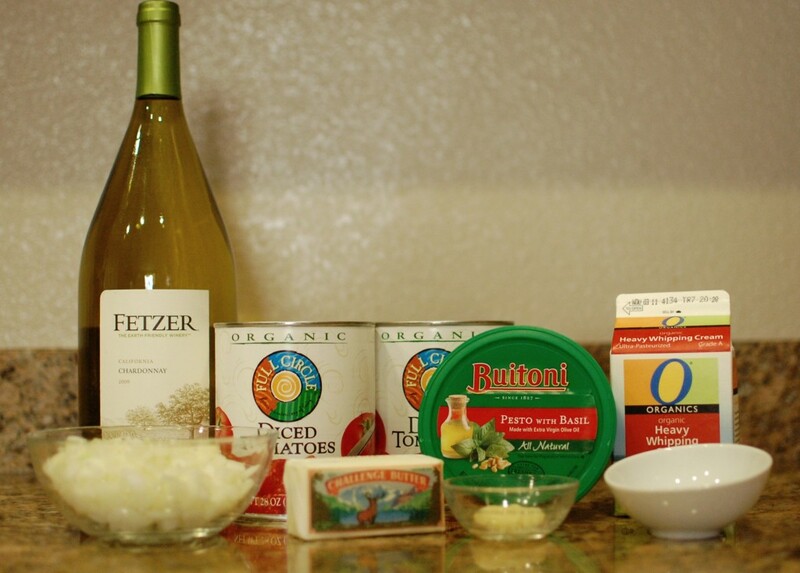 Also, for anyone who wants to substitute out the wine, you can sub chicken broth for white wine (in my experience). It will give you more flavour than substituting water. Oh my, that picture just made me drool. Yum. Man, now I'm craving tomato soup. Are those your photographs? They're beautiful! Just made this. VERY strong wine taste. Didn’t like it a bit. if you try it i suggest trying half wine and half water instead.